Sports card and memorabilia collecting is something that I remember doing when I was just 6 years old. It was 1987, and I was in a grocery store with my mom. I looked at a pack of 87 Topps, and asked my mother to buy it for me. She obliged, and in the car ride home I became hooked on the hobby. Thumbing through cards of Bobby Bonilla, Jeff Reardon, and Greg Brock really struck home to me. These were players that I would watch on TV, and read about in the newspaper, and here they were in my hands. From then on, I was a buying machine. Anything I could get my mitts on, I had to have: Topps, Donruss, Score, Leaf, and then in 1989 it happened…Upper Deck. Upper Deck was like nothing that I had ever seen before. The photos were original, not ones that were repeated over and over (Player X standing there with bat in hand, and no smile). There were action shots, players in the dugouts, and ones of players doing something that should have been on every card ever produce: smiling and having fun. I mean, that’s what this game and hobby is all about right? Having fun? The fun really came to fruition, with one product in particular. That product that I remember vividly purchasing was in a 1995 Upper Deck Baseball Series 2. I walked into my local card shop, which I practically lived at after school every day, and there it was staring me in the face. The owner told me that if I bought a 35-Pack box and sent in the wrappers with some extra money for shipping and handling, then Upper Deck would send me an autographed jumbo card of Alex Rodriguez. 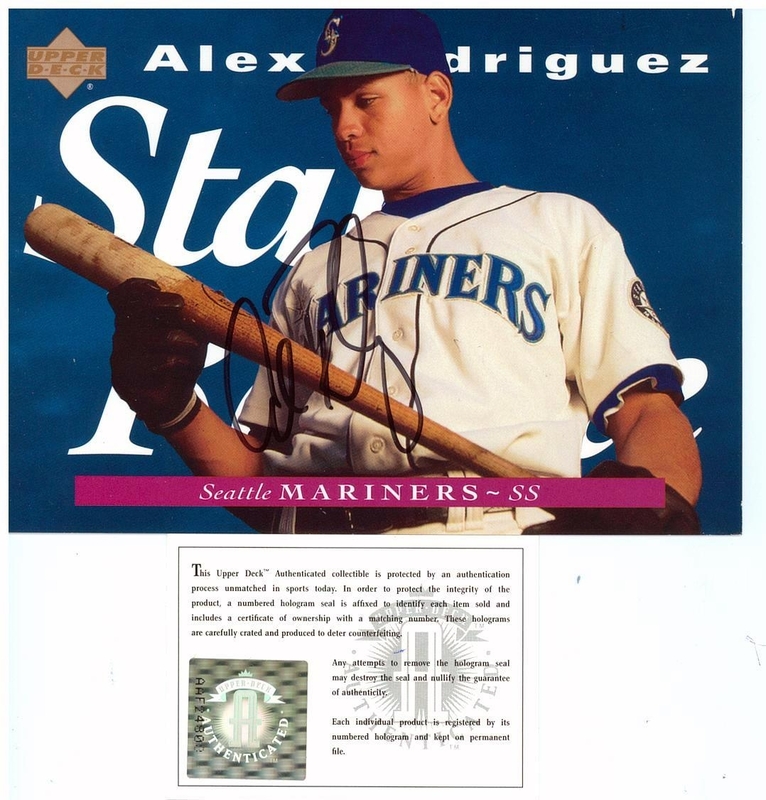 A-Rod was just making a name for himself in Seattle, and was the youngest player in baseball at the time. To say that I was all over that like pine tar on George Brett’s bat would have been an understatement! The problem was I didn’t have enough money for five packs, let alone an entire box. I put on my thinking cap, and started to brain-storm ideas on how to acquire the funds to get a box. The owner of the card shop was a HUGE Michael Jordan fan, and I happened to have about 15 Sports Illustrated magazines featuring MJ on the cover. I negotiated with the owner and we had an agreement that I would trade him my magazines for the box of Upper Deck packs. I could have set a world record for opening packs that day. My goal was to get the wrappers emptied and in the mail that very same day. It looked like the Tasmanian Devil was in the shop, with a whirlwind of wrappers flying all over the place. When all was said and done, the wrappers were packed and in the mail, and I spent the rest of the day with the owner, thumbing through all of my new Upper Deck cards. He was gracious enough to send me home with a storage box and a package of penny sleeves as well. All I could do now was wait patiently, which is extremely tough for a 14 year old to do. An image of the Upper Deck Alex Roduguez Autographed Jumbo Card sent. The mail man showed up 10-12 weeks later. You could label it as my first official Upper Deck Mailday. I carefully opened the package, and it was even better than I had imagined. The jumbo card of A-Rod, at a young age of 19, accompanied by a card-size certificate of authenticity was actually in my hands! In my mind, that sealed it, Upper Deck really could produce some cool stuff.Fast forward 17 years, and here I am still collecting, but not so much the standard cards anymore. I’m after those coveted autographs. I have limited myself to purchasing only Upper Deck products, and why not. I will browse eBay here and there, and even send out items to the players themselves. I look at my wall of memorabilia, thinking of what road to go down next, or what player I need to add to it, and I will catch myself looking at that jumbo A-Rod card. It takes me back to that day when I decided I had to have it, and it brings a smile to face. When people read this, I hope that it inspires them to go after what they want. Whether it’s that last card needed for a complete set, or it’s the start of their collecting careers. However you do it, make sure you it makes you happy, and make sure you do it with Upper Deck.